The Orientalist Photography Collection was created out of one individual’s efforts to preserve valuable historical information about the effects of Imperialism and Colonialism on the Arab world and make it a ccessible to all peoples. The archive houses five thousand photographic images and is still growing. It is a resource for present and future generations to learn from so as not to welcome or encourage Colonial Imperialism. This collection is an eye witness account of the effects of the western suppression of the Arab countries and people by the Turkish, French, English and Italians, all driven by self interest and exploitation. The collection includes late nineteenth century and early twentieth century architecture in Arab cityscapes and natural landscapes. The photos bear witness to the scars left by the Ottoman empire , French and English. The collection includes postcards and albumen photographs. The majority of the albumen photos where taken by professional photographers, including the Zangaki brothers, Pascal Sabah and Lehnert & Landrock. Orientalist photography (and painting) was born out of the westerners’ desire for entertainment and amusement. It capitalizes on portraying Arabs as savages in staged settings. One section of the collection, the Colonial Harem postcards, is a testimony to this notion. The Colonial Harem postcards were created primarily by French photographers. The models for these postcards were very young girls from north Africa, primarily Morocco , Alger , Tunis , and Egypt . The photographs were staged to duplicate the compositions of the western orientalist painters, embedding the false conception of the uncivilized Arab even deeper in the western psyche. The stereo-topical photographs of the Palestinian people and their lifestyle were created to target western Christians, many of whom never traveled from their homes but were curious about the birth place of Jesus. William Mark Fisher was born in Boston, MA in 1841. His family was poor, and he spent a good part of his childhood working. At the age of 14, he was apprenticed to his cousin – a sign and house painter – William Lawless. From this point on he began to study art – initially taking drawing classes during the winter months at the Lowell Institute. In 1863 Fisher met one of Inness’ patrons who proposed that he travel to Paris to continue his studies. He left for Paris and entered the atelier of Gleyre where met many other artists, including Sisley. 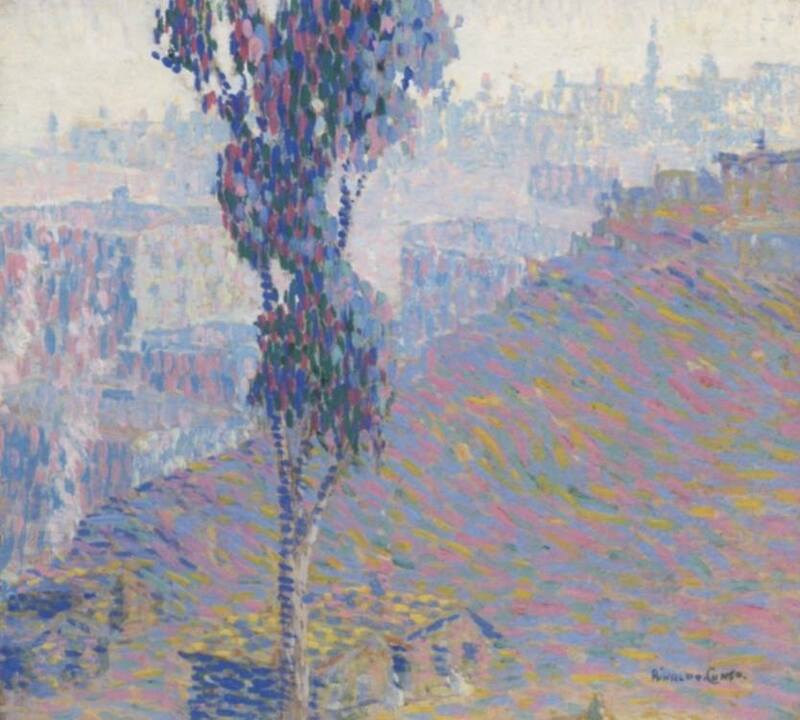 After finishing his training, he returned to Boston and continued to paint, but his work, which had a more impressionist style to it, met with little success and he finally decide to leave for Europe again. By 1871 he was on his way, first landing in Brest and then moving on to Normandy. By 1901 he was living in Hatfield Heath, where he would remain for the rest of his life. He was a frequent exhibitor at the Royal Academy – displaying his first work there in 1872 and continued to exhibit there until his death in 1923; showing more than 100 works (l). Fisher was elected A.R.A. in 1911 and a full member in 1919. 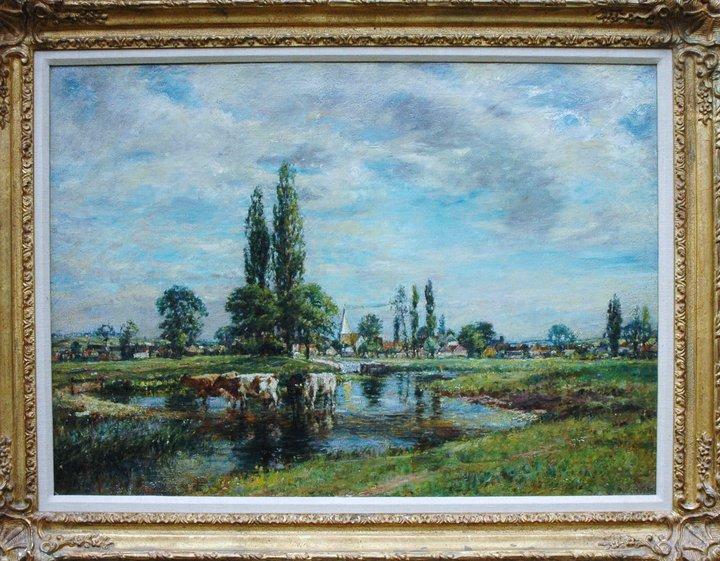 Among his exhibited paintings are: Noon (1872); Early Summer (1875); The Siesta (1877); Milking Time (1881); Early Summer – Sussex (1883); Environs of Algiers (1896); A Hampshire Village (1903); Ponds at Bexley (1906); Harlow Mill (1912); Cote d’azur (1913); White poplars: September (1915); Mont Canaille, Cassis (1917); and On the Shore at Emsworth (1921). It is interesting to note that Fisher is considered one of the first artists to bring the Impressionist style to England and was noted by George Moore, in 1893, as being [England’s] greatest living landscape painter. Fisher died on April 30, 1923. This painting by J.S.Sargent is 16×20 inch oil on canvas. 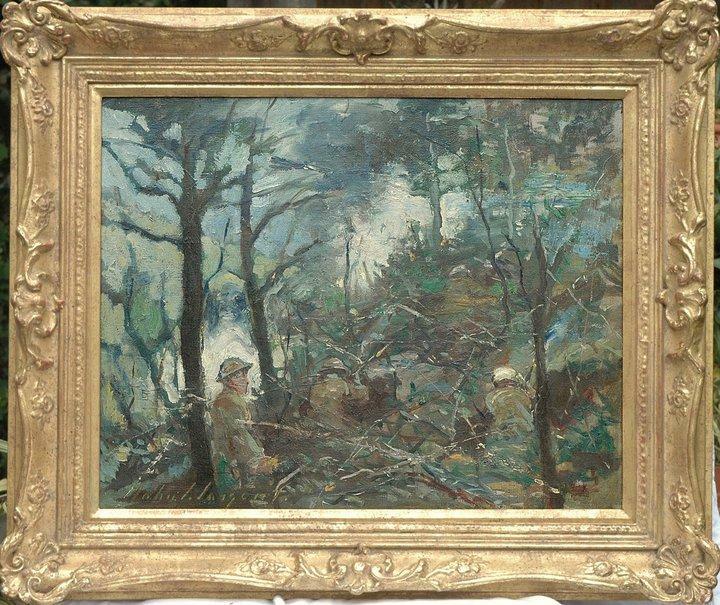 It shows the English soldiers in the middle of a battle during the WWI. Sargent was also affected by portrait style of Velasquez, the Tonalism or mood painting of James Whistler, and Impressionism of Edgar Degas. He spent time at Monet’s home town of Giverny, absorbing Impressionist techniques there. Sargent’s career ended in Paris with his painting “Portrait of Mme X,” 1884, because it was a startlingly accurate portrayal of a notoriously beautiful woman who was Sargent’s cousin. Some said the pose was provocative, but aside from the reputation of the subject, there seems little reason from a late 20th century perspective to find the work controversial. His last years he devoted to Impressionist watercolors of European scenes and architecture. He found watercolor to be the most pleasureable outlet for his tremendous energy and compulsions to sketch what he saw around him. He was a man who lived for his work and aside from general socializing had had little private life beyond his family. He never married although “he had at times adored certain women, momentarialy finding in them a reflected image of what he sought” (Mount 323). A major retrospective of Sargent’s portrait painting was held at the Tate Gallery in London in Fall, 1998. Rinaldo Cuneo is one of the few California artists who has experimented in many different styles throughout his artistic career. He is one of the few artists who was never satisfied with his present achievement and was well aware of the artistic revolution and the world’s instability which occurred as a result of the First World War and which ended by the end of the Second World War. 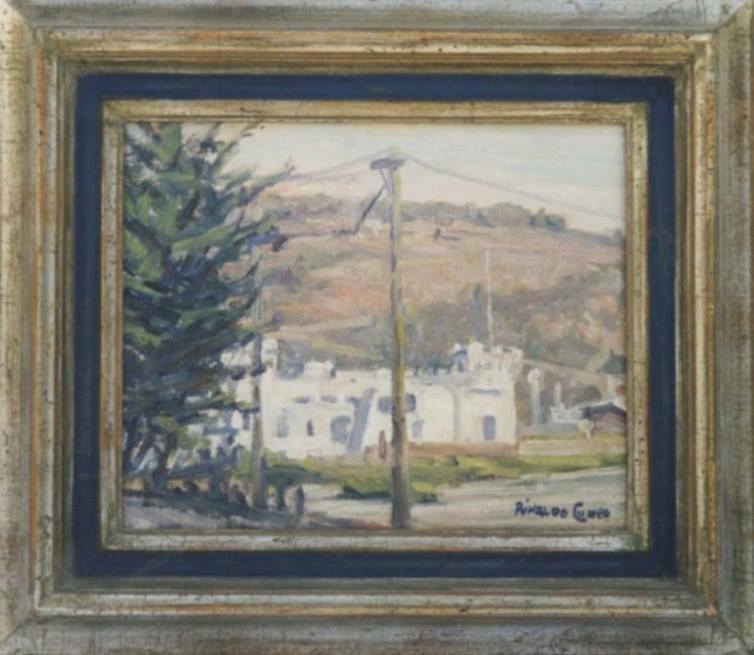 This example of Piedmont Hills view of the Northern California Bay area is an early work by Rinaldo Cuneo which was from the early nineteenth hundreds after his return from France in nineteen-thirteen. This view of Piedmont Hills is 20X24 inch oil on canvas by the artist Rinaldo Cuneo is is part of the American Impressionist Collection in The Farhat Art Musuem. Born in San Francisco to a family of artists, Cuneo studied at the Mark Hopkins Institute with Arthur Mathews, before attending the Academie Colarossi in Paris from 1911-1913. Upon his return to California, Cuneo’s works were well received at the Panama Pacific International Exhibition in 1915, and was involved in every major art exhibition in the San Francisco area from 1916-1939. Also during these years Cuneo was the subject of numerous one-man shows, including those in Rome, Los Angeles, London, and Paris. Called “the Painter of San Francisco,” at the inaugural exhibition of the San Francisco Museum of Art in 1935, Cuneo had the most number of paintings displayed by any early California artist. 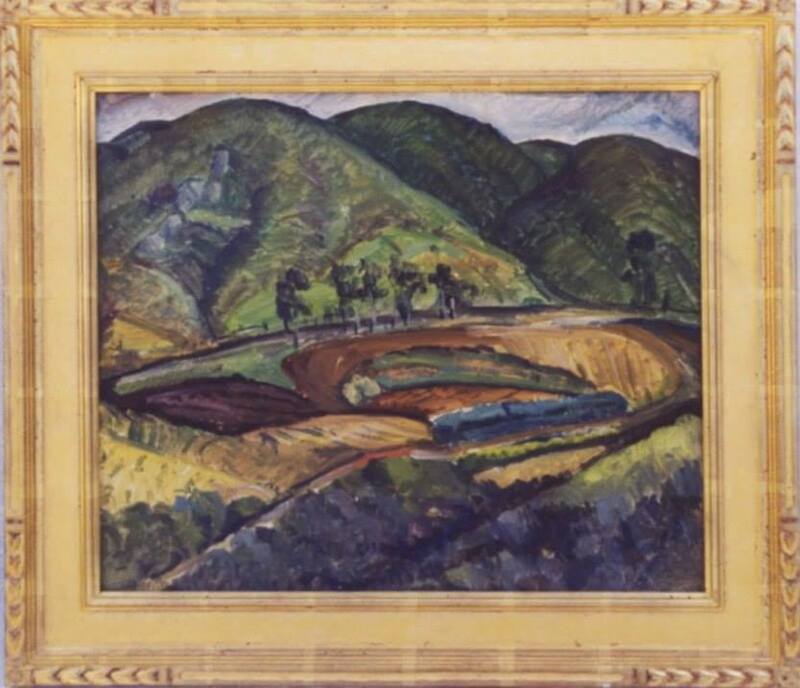 In that same exhibition, his painting California Hills won the Museum’s Purchase Prize award. 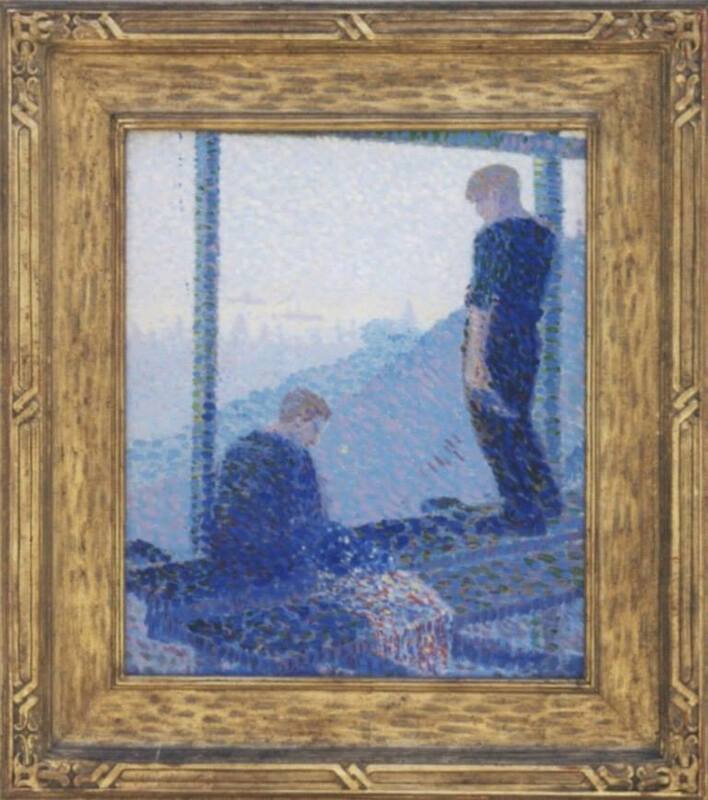 A pure impressionist early in his career, Cuneo’s style constantly evolved throughout his life, as he was always seeking and assimilating new methods of representation.